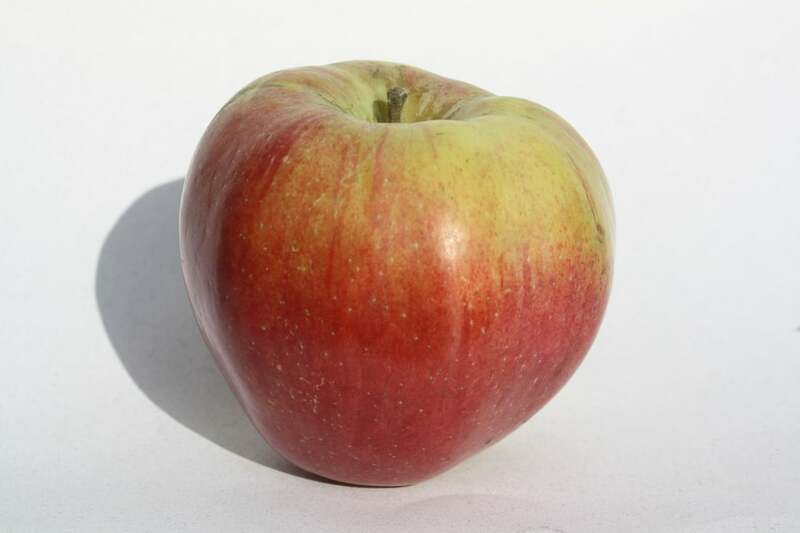 Other names: Green Peak Spy, Northern Spie, Northern Pie Apple, Spy, Red Spy, Red Northern Spy, King Apple. King’s Apple. Identification: A large apple and round, somewhat conic with distinct ribbing. Skin base colour is green over which are flushes and stripes of red. Small, distinct whitish lenticels are scattered sparsely over the surface. The calyx is small and closed, set in a deep and narrow basin. The stem is short and slender, set in a deep and narrow, russetted cavity. Uses: Can be eaten fresh, but most often used for making pies (it holds its shape well). With a sugar content of almost Brix 14, it is also used as for making blended cider. Origins: According to a letter written by Oliver Chapin in 1847, it appears the first Northern Spy was grown by Heman Chapin (Oliver’s brother) on his farm near East Bloomfield in Ontario County, New York State (U.S.A.), from seeds brought from Connecticut State by Elijah Taylor around 1800. Heman Chapin’s seedling died before bearing fruit, but shoots began to spring up from the roots. Roswell Humphrey (Heman’s brother-in-law) took several of these sprouts and nurtured them until they finally bore apples, the first actual Northern Spies. Introduced in 1840. 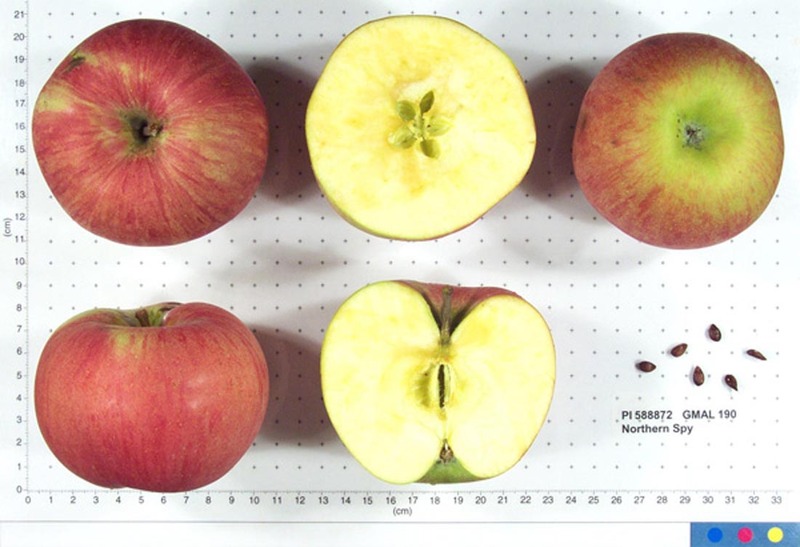 One of the parents is believed to be the Wagener apple. Cultivation: Moderately vigorous, upright, brushy tree. Partial tip bearer. Will take over 10 years to bear fruit unless grafted to highly vigorous root stock. It has a slight tendency to bear every other year, but this can be controlled with thinning after fruit set. Crops are often moderate. Not a good choice for commercial operations since one in 10 apples grades well, but a consistent seller in farm gate operations. Ploidism: Diploid. Partially self fertile but produces best in the presence of a compatible pollination partner. Notes: The Northern Spy shares with Red Delicious and IdaRed the distinction of having the greatest number of antioxidants which reduce the susceptibility to heart disease and cancer. Cold storage: It keeps up to six months. Harvest: Ready for harvest starting in the middle of the fifth period (150 to 160 days after petal fall).